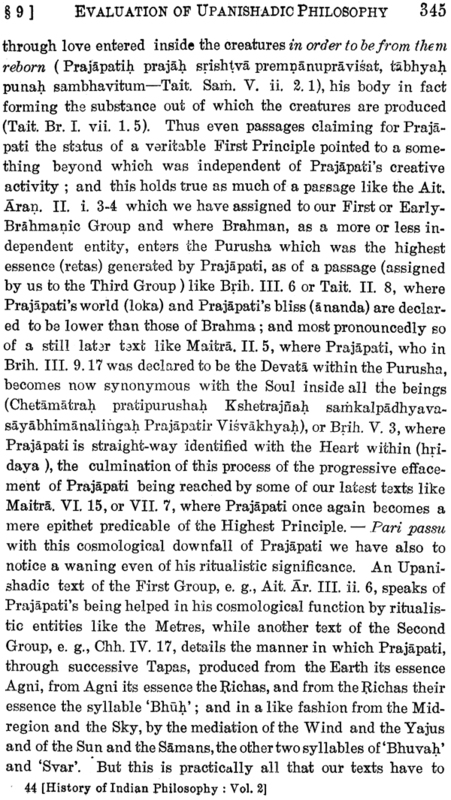 This volume outlines the philosophic speculations from the hazy dawn of Vedic times, which in the opinion of the authors is the creative period, and includes into its fold a survey of Brahmana literature and speculations and its chronology and its subsequent transition to the Upanishadic period. 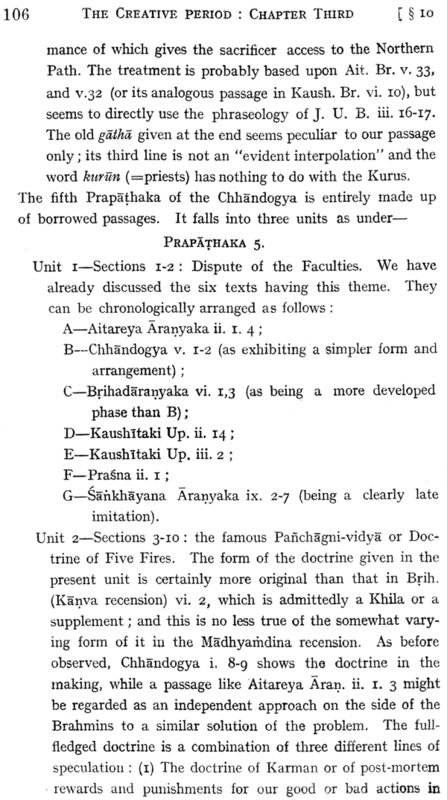 The learned authors have very skillfully shown by way of comparative charts the chronological grouping of the Brahmana and Sruti texts according to the Sakhas which very scholarly sums up the learned exposition of the authors. 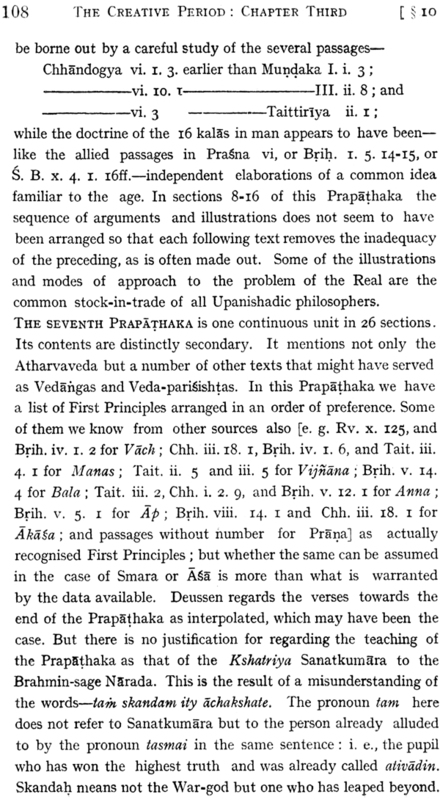 Chapter nine, in essence represents the soul of the volume, and is the largest and presents an evaluation of the Upanishadic philosophy by the authors and offers material for testing the plausibility of their new attempt at distributing the Upanishadic texts into stratified groups. In the opinion of the authors, this book should eventually be judged by this chapter. They have spared no pains in making it complete and up-to-date and in their conclusion they have ventured to differ in places from such masters as Garbe, Jacobi, Hertel, Oldenberg, Hopkins and others. 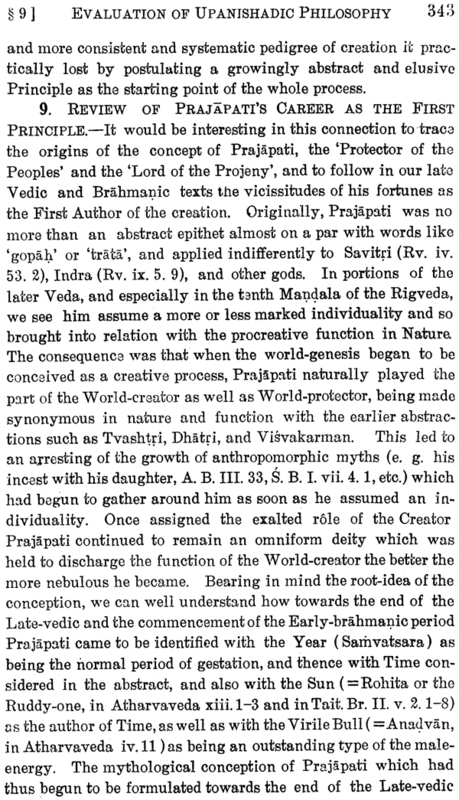 The authors have treated of the Post-Upanishadic thought-ferment of different individual philosophers and have also drawn their conclusion as regards the place of the Mahabharata in the religious and philosophical history of Ancient India. S.K. 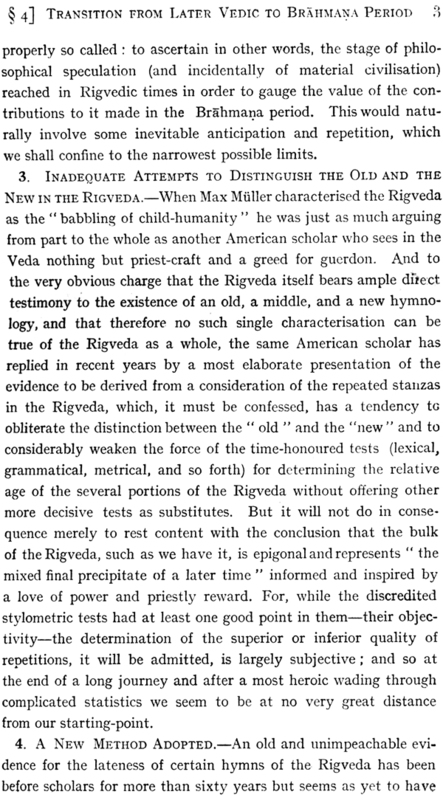 Belvalkar (1880-1967) born at Kolhapur, Maharashtra and got his education in Bombay and Harvard universities. He was Hony. Secretary, All India Oriental Conference in 1926-27, and was elected as Hony Fellow, Royal Asiatic Society, London in 1947. He was co-founder and Hony. Secretary of Bhandarkar Oriental Research Institute, Poona in 1915-18 and 1927-33. 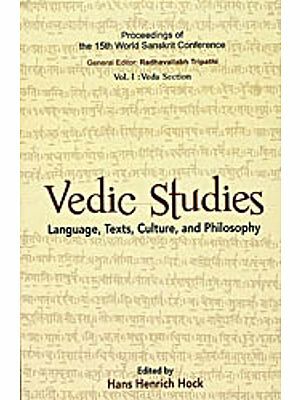 His important publications are: Systems of Sanskrit Grammar (1915); Rama's Later History (1925); Dandin's Kavyadarsa (1924); and Bhagavadgita (1941). R.D. Ranade (1886-1957) born at Jamkhandi in Karnataka. 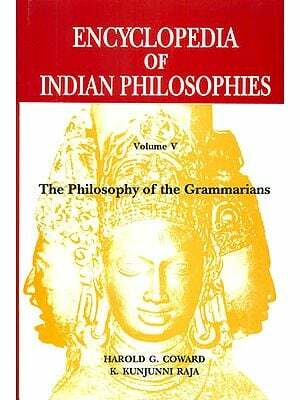 He was Emeritus Professor of Philosophy and Vice-Chancellor, Allahabad University. 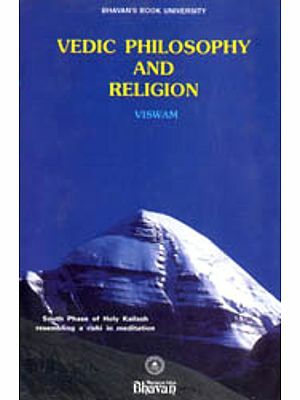 His important publications are: Constructive Survey of Upanishadic Philosophy (1926); Mysticism in Maharashtra (1930); Philosophical Essays (1956); and Shri Bhagavat Gita as a Philosophy of God-Realisation (1958). IN THOSE hopeful, blissful, Undergraduate days of ours we all of us indulge more or less in dreams about our future The dreams indeed are for the most part cut to the same pattern, and very few of them are really of a kind that can be taken seriously; but of these very few there normally is some one or other that haunts us all our life. 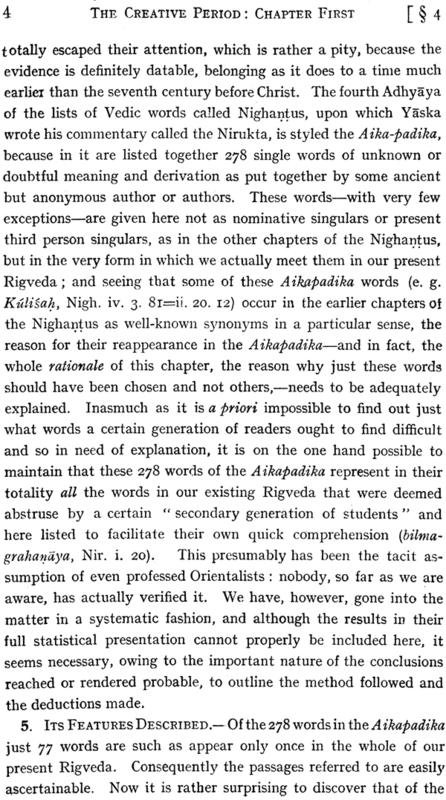 One such, to the lure of which the joint authors of the present undertaking fell victims-each independently, and after his own fashion-was that of writing a monumental History of Indian Philosophy. We both of us can yet recall-vividly as though it happened just the other day-the occasion when the fascination first caught hold of us. 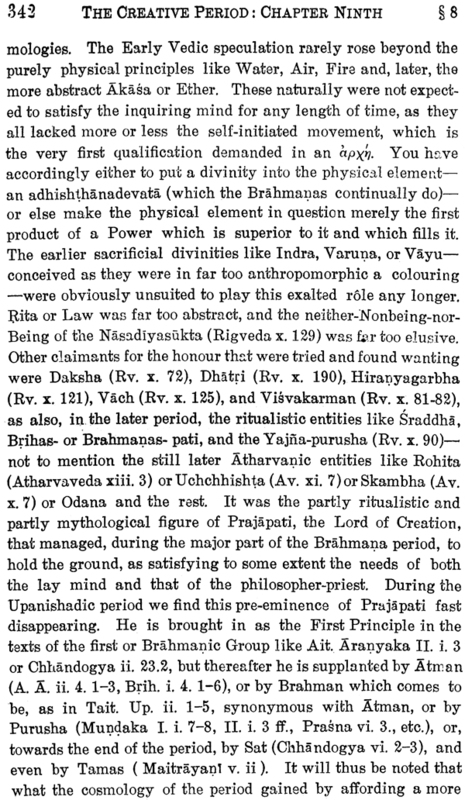 Dr. Belvalkar upon whom the idea dawned when he was making his first acquaintance with Sankaracharya's immortal Bhashya on the Brahmasutras placed himself immediately under the direction of the late Dr. F. G. Selby, who, in his days, did so much for the promotion of philosophical studies in the Deccan, and who advised him not to take up the project before he had thoroughly familiarised himself with Greek and Modern European Philosophy, as also with the political and the cultural History of Europe. This meant an arduous preparation of five years and two extra University examinations. 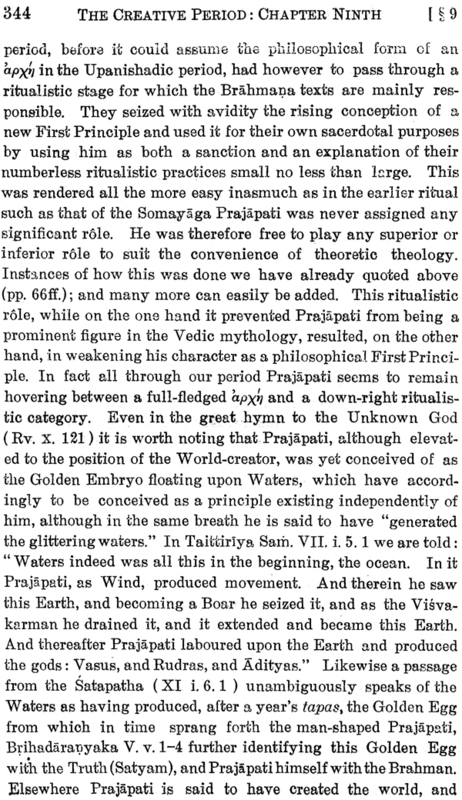 Professor Ranade was led-by circumstances which need not be here detailed- to make a living acquaintance with Mysticism and religious thought before he came to have an academic acquaintance with European and Indian Philosophy. 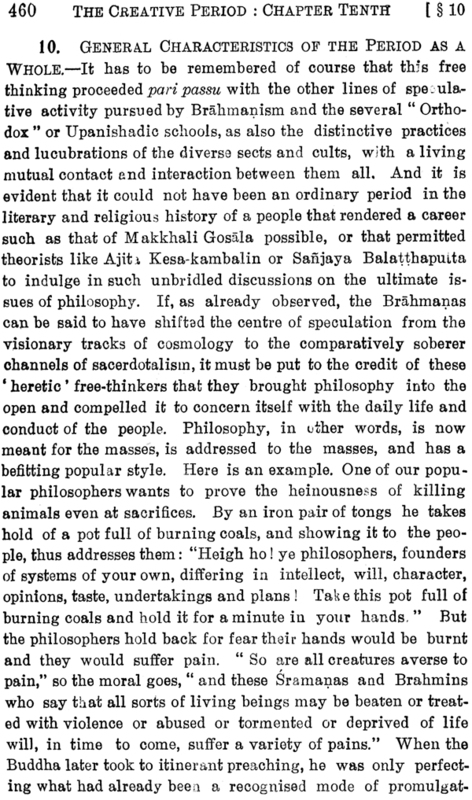 The joint authors, although more or less contemporaries at the Deccan College and so sufficiently known to each other, never had any occasion to exchange views as to what each of them had set before himself as his life's task. But certain domestic calamities which befell them both in the span of a couple of fortnights spent under a common roof helped to draw the bonds of their earlier friendship still closer, and in a communication of hearts each discovered that the other had been entertaining the selfsame literary ambition, and had been assiduously preparing himself for it all those years. 'What more natural under the circumstances than that the two should agree to collaborate on a joint project, for the adumbration of which the authors remember having spent much mid-night oil for weeks? 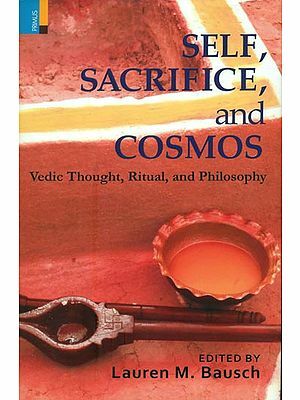 A sacred fervour seemed to inspire the work, and it is that same fervour of piety that is trusted, Deo volente, to bring the undertaking to an eventual conclusion. 2. 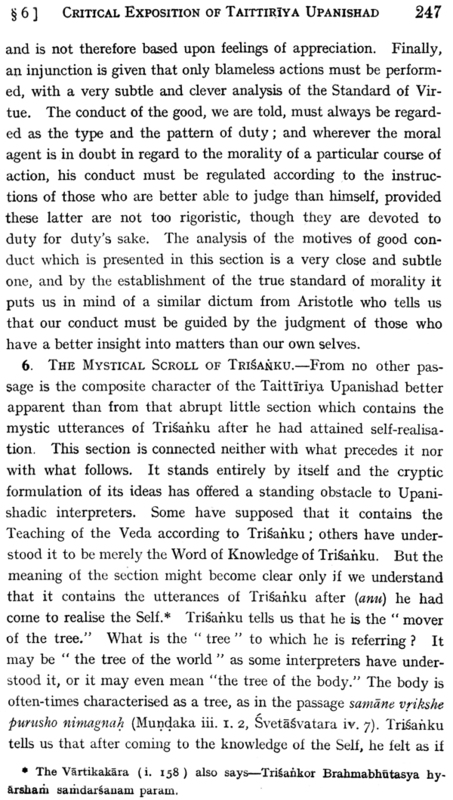 It will thus be seen that several years of apprentice- ship intervened before our original dream of the History of Indian Philosophy was concretely formulated into the "Outline Scheme" for the same, published by us in 1919 for private circulation. 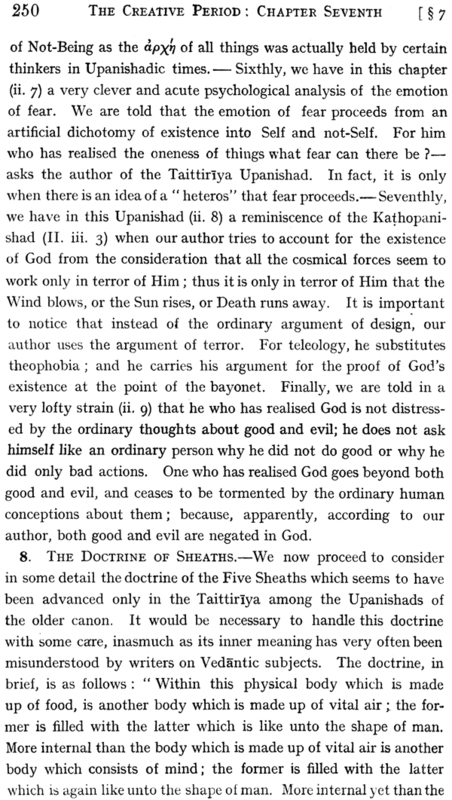 Our scheme had the good fortune of receiving the commendation and blessings of the late Sir Rsmkrishna Gopal Bhandarkar, whose" Foreword" (dated 5th December 1918) to the scheme-along with the scheme itself-is reproduced at the end of this Volume. 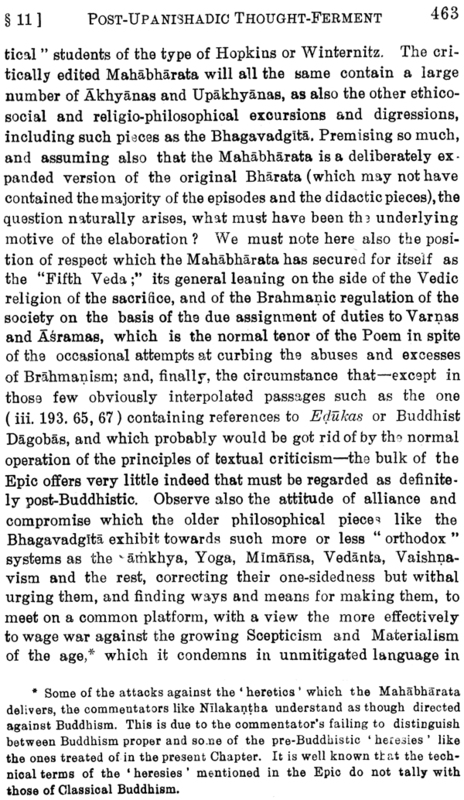 Practically everybody to whom we wrote about the scheme asking for advice and assistance-such as H. E. Lord Ronaldshay, sometime Governor of Bengal, the late Sir Asutosh Mookerjee, the Vice-Chancellor of the University of Calcutta, the late Lokamanya Bal Gangadhar Tilak, and Shrimant Narayanrao Babasaheb Ghorpade, the Chiefsaheb of Ichalkaranji-welcomed it as a monumental task, the first of its kind, and capable of filling a sore need of our Oriental studies. And it was in consequence of such favourable reception of the scheme that, upon the reeommendation of Sir George Lloyd, the late Governor of this Presidency, the University of Bombay agreed, in 1920, under certain conditions, to advance by way of preparation money a sum of Rs. 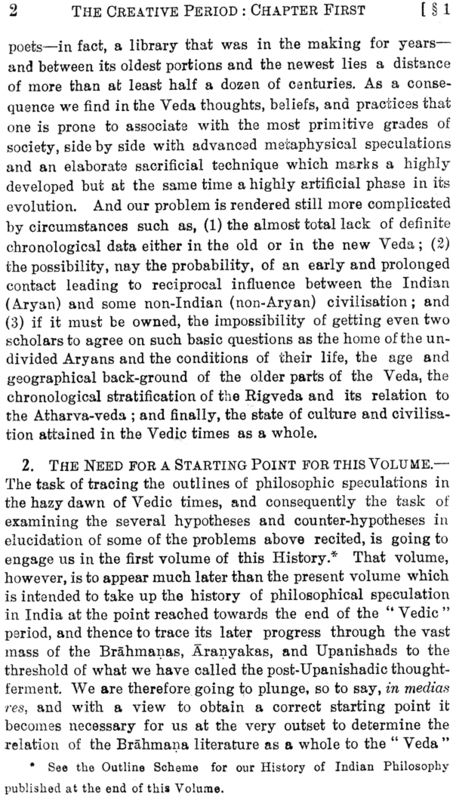 six thousand per volume for three out of the projected series of eight volumes, the original conditions being, in 1923, modified whereby it was stipulated that the joint authors were to return to the University Rs. 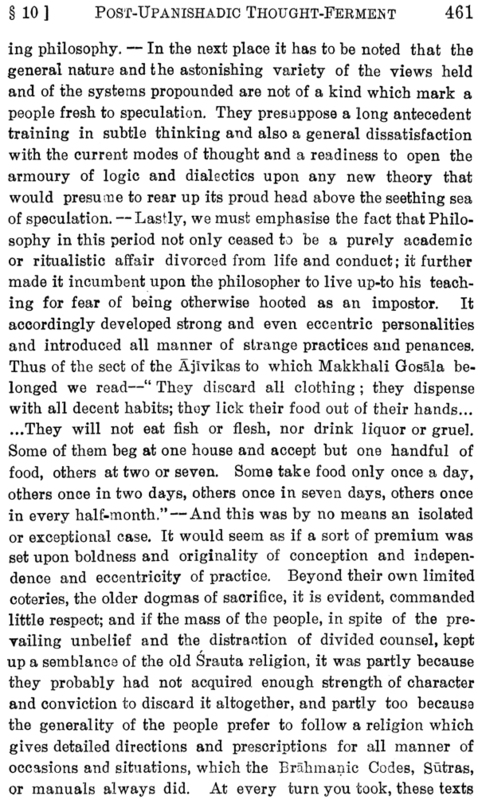 four thousand per volume within a year of the date of its publication. 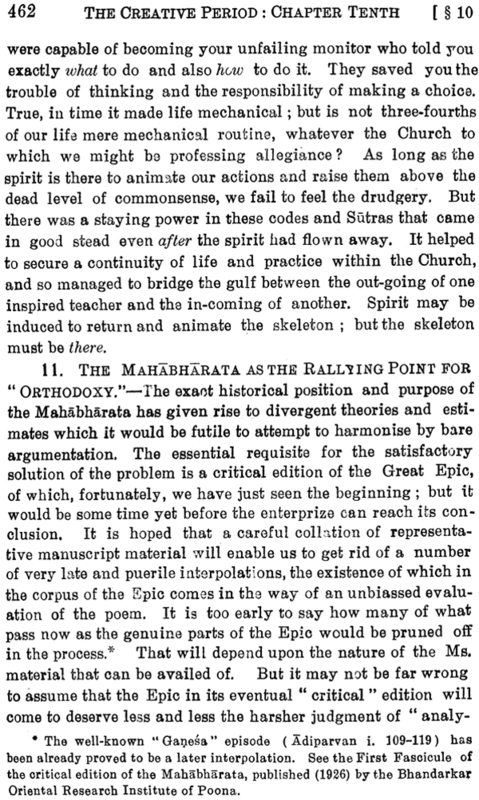 It is thus that the present Volume is being issued under the patronage of the University of Bombay. 3. 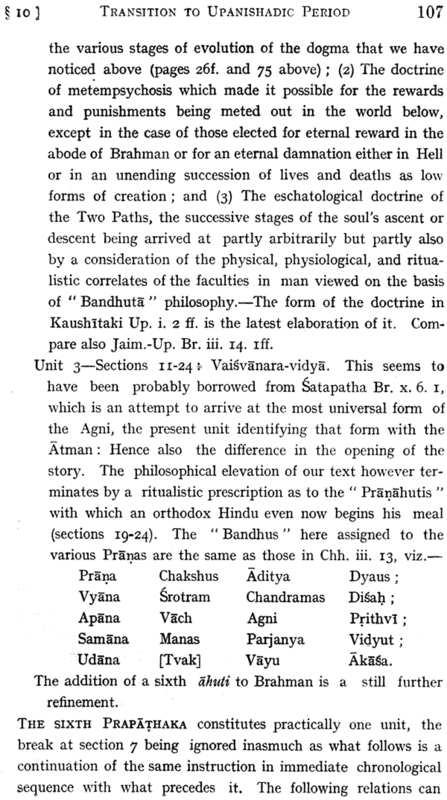 When originally formulated in 1908 ours was the first and the only scheme for a systematic History of Indian Philosophy in the field. But between 1918 and 1928 much water has flowed under the bridge. 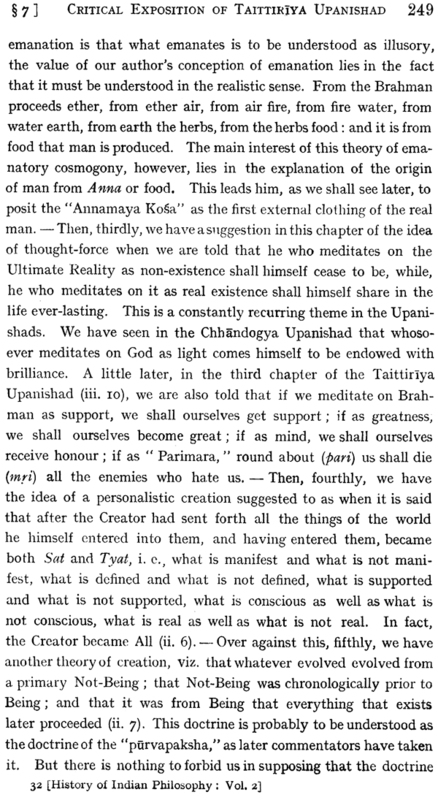 Thus Das Gupta published in 1922 the first volume of his projected History of Indian Philosophy in two Volumes, and Radhakrishnan bas completed his History in two volumes, the first of which appeared in 1923 and the second in 1927. 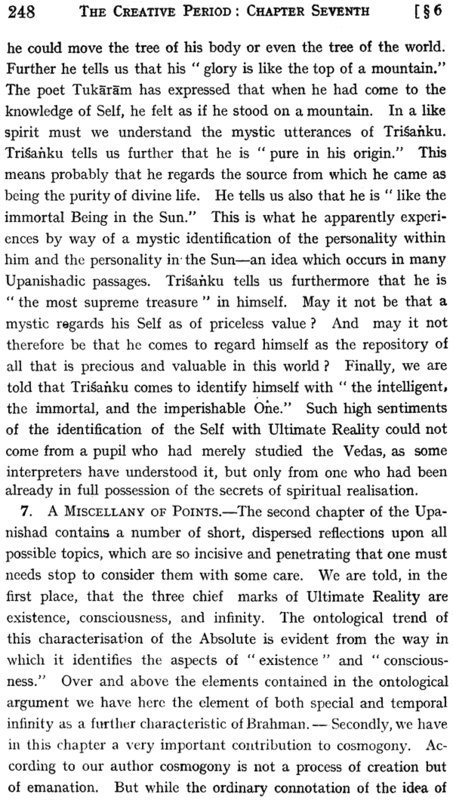 There have also been issued smaller epitomes such as the" Esquisse d'une Historie de la Philosophie Indienne " by Paul Masson Oursel (Paris, 1923 ), and the " Indisohe Philosophie " by Otto Strauss ( Munchen, 1925 ), and other still shorter ill monographs by Oldenberg in the" Kultur der Gegenwart" and by Jacobi in the" Licht des Ostens." 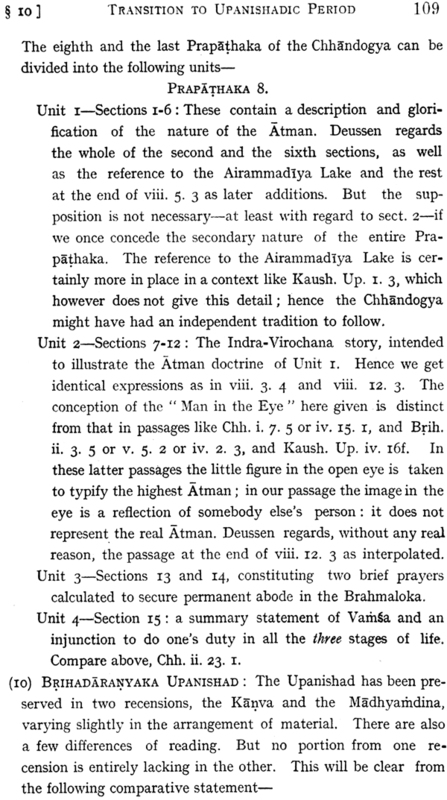 Also, on the special subject covered by the Volume now published, there appeared Oldenberg's "Die Weltanschauung der Brahmane-Texte " (Gottingen,1919), Hertel's "Die Weisheit der Upanishaden " (Munchen, 1921), besides his several publications in the series entitled "Indo-Iranische Quellen und Forschungen," and a large number of contributions by several European savants to the various learned publications of Europe to which, we hope, adequate references have been given in our notes.-Keith's two volumes on " The Religion and Philosophy of the Veda and Upanishads" in the Harvard Oriental Series came too late into our hands for any specific reference in our Volume. 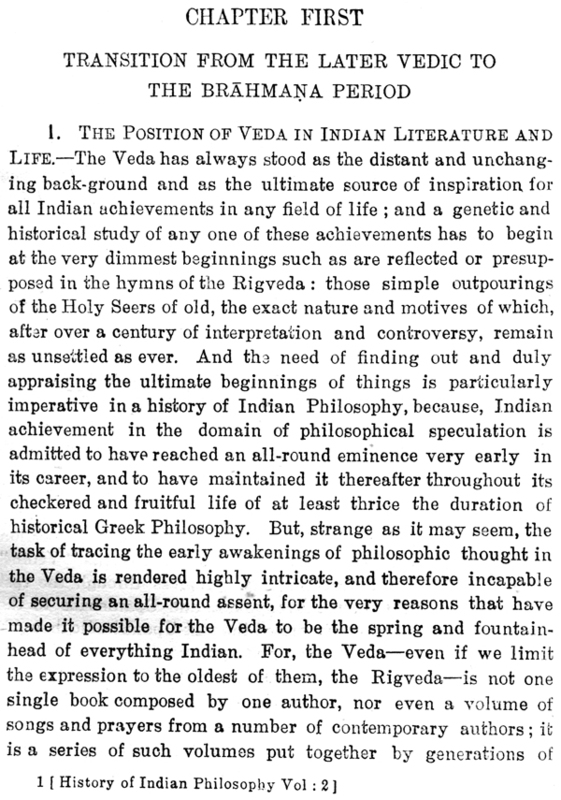 This plethora of writings on the subject of Indian Philosophy in the course of the last half a dozen years ( several others there are to which we do not think it necessary to refer here) simply proves to our mind that the scheme as we formulated it in 1918 was none too late in the field; and if the results of our scheme have not been actually the first on the market, the joint authors venture all the same to hope that their present work has not been in any essential respects anticipated or rendered nugatory by any of the above publications.